Ever since I got highlights a few weeks ago my hair has looked and felt like straw. It doesn’t help that I live in the desert and my hair is getting fried by 90 degree weather every time I step outside. And this is just the beginning, we haven’t even hit triple digits yet! I have been using Paul Mitchell moisture shampoo and conditioner which is good stuff in normal weather but I’ve had to up the ante with some serious moisture. If you’ve red my reviews in the past, you’ll know that a while back I reviewed Wen by Chaz Dean Cleansing Conditioner. This stuff moisturizes like a dream but my scalp start getting gunky and I stopped using it, not too mention it’s around $27 for 12 oz. I was foraging in my cabinets for something to deep condition my hair and found the left over Wen. I used what was left in the bottle and my hair instantly felt rejuvenated and silky, so of course I’m back on the Wen bandwagon. I can’t believe I ever stopped using this magical cream. I just need to make sure I rinse better to avoid scalp build up. When it comes to the condition of my hair, $30.00 is nothing. I originally had the Sweet Almond Mint. I just ordered the Fig (Which is supposed to be the most moisturizing) from QVC, I will post my review once I get it. 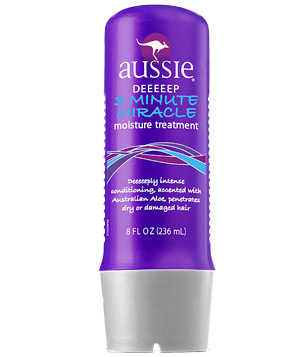 One of my coworkers kept telling me about the wonders of Aussie 3-minute Miracle Moisture Treatment which I instantly shot down. I’ve seen the people in Aussie commercials, long silky blonde hair and creamy white skin. That girl is lovely but that girl is so not me and I refused to think it could work on my hair. Well my friend called my bluff and made me a sample kit of her favorite products. I reluctantly used this deep conditioner after washing with Wen and did I feel foolish for judging a book by its cover! Consider me converted, I will never be a naysayer again. I left it on for about 10 minutes and again my hair was extra silky and revitalized. What’s even more amazing is you can buy a full-sized bottle for under $4.00 at just about any drugstore. Aussie 3-Minute Miracle has natural Australian aloe and jojoba oil in it to really repair damage and pack in the moisture. 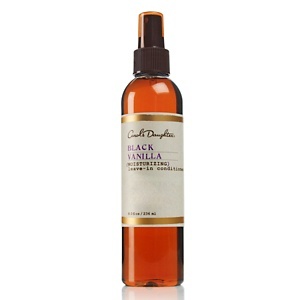 Another wonderful product is Carol’s Daughter Black Vanilla Leave-In Conditioner. My hair is always super tangled after I wash it and even though the Wen and the Aussie cut back the tangles a great deal, I can always use extra help. I normally use Miracle 7 mist for detangling but since my girl was right about Aussie, I had to try the Carol’s Daughter sampler. I’ve heard about Carols Daughter products for years and always wanted to try them out so this was a great introduction to the line. This conditioner contains lavender, honeysuckle, sage and marigolds and is all natural. This product helps bring shine to hair damaged by chemical processes and harsh weather conditions with an infusion of selected herbs, flowers and plant elements. It smells wonderful, like soft coconut and vanilla and isn’t greasy at all. I sprayed it all over and it definitely helped with the detangling process. It’s only $12.00 at HSN and will last a long time, Sephora also carries the Carol’s Daughter line. I heard this is also a great product to revitalize curls and help with the scrunching process for girls that wear their hair curly. You can also spray this on to dry hair to use as a conditioning aid when your hair needs a boost. I haven’t tried that yet so I can’t say how well that works. This product is a keeper for sure. I really like that it’s natural too, I’m trying to use less chemicals in my hair. If you’re trying to beat the heat or repair damaged hair, you can’t go wrong with these wonderful products. I’m also really into hair oils and will be doing a post on the best ones I’ve tried soon. What products do you use to give your hair a moisture boost?